TUC | Ipswich Unemployed Action. Ipswich Unemployed Action will be taking a keen interest in Labour’s policies on welfare. Newly appointed shadow Work and Pensions Secretary Owen Smith says he plans to make welfare boss Iain Duncan Smith’s life “not worth living” as he harries him. Labour will challenge the Tories “at every turn” in a fresh assault over Bedroom Tax . And new shadow Work and Pensions Secretary Owen Smith threatens he will make welfare boss Iain Duncan Smith’s life “not worth living”. We remain open-minded about Owen Smith. Owen Smith, Shadow Welfare Secretary, has called for a debate within the Labour party over benefits cap. The Government is planning to reduce the benefits back from £26,000 to £23,000 – a plan that Labour oppose. In an interview on Newsnight, Smith said that Labour’s current policy is to oppose the cuts to the individual benefits cap. But he noted that Labour need to review their position “right across the whole debate”. He went on to say that the party is “”in favour of an overall reduction in the amount of money we spend on benefits in this country and in favour of limits on what individual families can draw down”. However he said that there needs to be a review of the party’s position to the cap in general. Jeremy Corbyn’s plans to oppose the benefits cap have been undermined by members of his own shadow cabinet, as he prepares to face David Cameron in prime minister’s questions for the first time. Speaking to the Trades Union Congress conference in Brighton on Tuesday, Corbyn said the benefits cap introduced by the coalition created “social cleansing” and that the party would oppose it all together. But speaking hours later on the BBC’s Newsnight programme, the shadow work and pensions secretary, Owen Smith, said the party was only opposing government plans to reduce the cap. The shadow equalities minister, Kate Green, speaking on BBC Radio 4’s Today programme on Wednesday, said the Labour party’s present policy position was to support the principle of the benefit cap and that there was some evidence it had helped people into work. She argued that policy was created collectively by the party, implying that Corbyn could not change Labour’s position unilaterally. In the last parliament, the coalition introduced a cap of £26,000 on the amount of state benefits a family can receive. The Conservative government has pledged to cut the cap to £23,000 in London and £20,000 outside London. 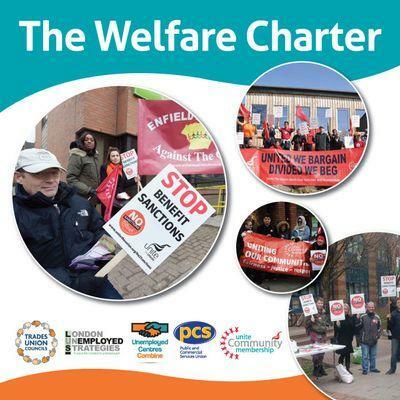 TUC Welfare Conference: Action on Sanctions and Workfare! TUC: Welfare Conference, called by the TUC Consultative Committee for Unemployed Workers’ Centres. Up to a hundred activists came to the Welfare Conference, held on Friday in Congress House. As the introductory speakers made plain the Liberal-Conservative Coalition, assisted by large sections of the media, have launched a frontal assault ion the basic principles of an equitable benefit system. Instead of helping people in need they have attacked the most vulnerable. Eleanor Firman (Disabled People Against Cuts, DPAC and UNITE) illustrated what this has meant on the ground. As a result of cuts in housing benefit and the bedroom tax their group in Waltham Forest had had to defend those facing eviction. She talked of how the Work Capability Assessment targeted disabled people. Those not meeting the government’s criteria – enforced through a flawed system run by private companies (ATOS and now Maximus), could expect to be treated with “harshness”, to the point of being left destitute. This was only one example of how welfare ‘reform’ was making people’s lives a misery. The answer was to challenge the DWP with the help of bodies like UNITE Community and, where they still exist, Law Centres. Workshops covering benefit sanctions, the basis of the benefit system, unpaid work, and equality were held. In the one I attended, on Sanctions, participants concentrated less on particular stories of injustice than on the nature of the arbitrary regime. We tried to bring together a rejection of all sanctions with proposals for realsocial security for all. Disabled needed to be assessed not by private companies and computerised questionnaires, a source of many sanctions, but by clinical criteria, – the work of GPs. The power of ‘work coaches’ to decide to withdraw benefits – whether they should eat or have a home – should be removed. There were fruitful discussions throughout the day. Groups talked through proposals for a universal minimum income, others investigated the socialisation of basic needs, “universal goods in kind’, proposed by the Greek party, Syriza. A group of us looked into the use of Blogging, Twitter and other social media to spread an alternative message to the media hate campaigns. Others planned activities on Monday the 2nd of March Day of Action against Maximus and the 19th of March Day of Action Against Benefit Sanctions. Further protests against benefit sanctions are planned to coincide with May Day. In the afternoon Richard Exell, the TUC’s senior Policy Officer on these issues, spoke. He cast aside his prepared notes. Instead he talked of how public opinion had been swayed behind the Coalition’s polices. Cautious about demanding an end to all sanctions Richard observed, however, that the way they had left hundreds of thousands destitute may help to alter popular attitudes. The children of claimants, through no ‘fault’ of their own, were left hungry and dependent on food banks and charity. Now they will affect those in low-paid work who received benefits. There was a need to develop alternatives to this and to Universal Credit. Paula from DPAC stated that the introduction of the new system, with its new complicated ‘claimants’ commitment’ spelled ‘Armageddon’ for those reliant on benefits. A set of principles and demands – drawing on the Centres’ Charter for the Unemployed is being drawn up. It will include demands for a decent level of benefits, an end to sanctions, and opposition to all forms of workfare – to make volunteering really ‘voluntary’ – a higher minimum wage, rent controls, and decent jobs for all. These will be put into a coherent form at a further meeting on the 25th of March. The finished programme will be designed to take into union bodies and wider afield. People are urged to support Boycott Workfare. In a speech that touched on the way activists can change government and party (Labour) policy Lynne Groves drew on the way the Bedroom Tax had been challenged, and cuts in social services opposed. Activists and the wider public were urged to get involved in UNITE Community Branches, open to all. At the end of the meeting Kevin Flynn noted the seriousness and richness of the debates that had taken placed. Amongst other points he welcomed the “historic formation of the National Union of Bloggers”. The breadth and depth of the experiences of those attending this meeting – about a hundred strong – were striking. The words ‘the labour movement’ really came to life. There was strong participation of the disabled, young people, women, and black people. Those attending came from a wide variety of work backgrounds: from heavy industry, clerical and service work, to the voluntary sector. Delegates attended from all over the country, from Newcastle, Liverpool to the West Country and even South London. It was, as always, a real pleasure to hear Northern accents. The discussions were more than good natured and creative. Everybody had something to contribute. It was, in short, bloody great! This Motion was passed at the TUC Conference this week. Congress is proud of the role trade unions played in founding the welfare state as a social insurance from each according to their means, to each according to their needs. Congress notes, with concern, the clear rise in levels of deprivation since May 2010. New inequalities having a deleterious impact upon the lives of vulnerable people are increasingly obvious to all those working in the public and voluntary sectors. Services are becoming ever more fragmented, leading to wide variations in access across geographical areas of the UK. Vulnerable groups are experiencing increased poverty and lack of support as a direct result of government policy specifically designed to promote this same fragmentation of services to susceptible groups including children, the elderly and the disabled. Congress further notes several aspects of government policy that will lead to additional destruction of the security of vulnerable groups. Proposed moves such as the regionalisation of pay will lead to further attacks on the support for those groups in society that have the fewest defences of their own. Congress notes that around £30bn of welfare cuts have been announced by the government. Congress is appalled that disability hate crime has soared to record levels. a determined and robust opposition to the threats being posed to those in society who have the fewest defences. Congress re-iterates its commitment to the pursuance of equalities in society. Congress further notes that millions of people are barely surviving on poverty-level benefits or need tax credits to subsidise low wages. Congress believes we have a responsibility to support Unemployed Workers Centres which provide assistance for job searching and benefit advice. Congress condemns ‘workfare’ policies that compel the unemployed to work for their benefits and calls on the government to make work experience schemes optional and paid. Trades Councils Call to Boycott Workfare. Trades Union Councils* Annual Conference 2012 – Resolutions. replaces paid jobs and pushes wages down. not a privilege and need to be protected. “1. Support the occupation of companies carrying out workfare schemes. shaming all companies currently involved in this exploitation. 3. Support the boycotting of all forms of compulsory unpaid work, including internships. * Trades Councils are the lay local wing of the Trades Union Congress. They are made up of affiliated unions on a town, city and county basis. Ipswich Trades Council supports this motion, which updates one we drafted a few years ago on Flexible New Deal and the threat of workfare.